The Nokia N800 Internet Tablet now supports Skype internet calling, following an operating system update from Nokia. The upgrade also adds an Adobe Flash 9 browser plug-in and support for 8GB memory cards. The Nokia N800 OS2007 update provides the Internet Tablet device with the ability to make Skype calls, so N800 users can make low-cost VoIP calls wherever there is a suitable Wi-Fi hotspot. The Flash 9 update delivers a much better browser experience when viewing rich media sites (including YouTube ). And according to Nokia it's the most-wanted feature N800 users have requested. It also significantly improves the video streaming performance of the N800. Previously, the Nokia N800 supported SD or MMC cards up to 2GB, with two memory card slots in the device. With the upgrade, the N800 can now take cards of up to 8GB - increasing overall memory card storage capacity to 16GB. Other improvements to the Nokia N800 from the OS upgrade include improved battery performance for online usage, plus improvements to applications to allow quicker scanning of media content on the device. 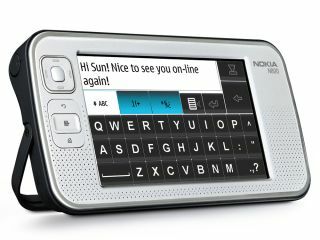 In addition, the N800's touchscreen sensitivity has been enhanced through software improvements.